Have you heard about J. N. “Ding” Darling National Wildlife Refuge? It’s on Sanibel Island in southwest Florida. It includes over 6,000 acres of mangrove estuaries, interior wetlands, and wooded areas, which provide food and shelter to migratory and resident birds, along with fish and animals. This Refuge is one of over 500 in the United States. http://www.fws.gov/refuge/JN_Ding_Darling/ offers more information about the refuge. J. N. “Ding” Darling developed a natural ability to influence people, through his fame in editorial cartooning along with his oratory skills, and used these tools to encourage people to take action in conservation. He initiated the Federal Duck Stamp program. http://www.dingdarling.org/index.html explains his story in more detail. When nature beckons I clearly hear the call, immersing myself at the Refuge for a several hours. It a gift to witness, sometimes very close up, the multitude of huge white pelicans, wood storks, pretty-in-pink spoonbills, wide varieties and sizes of herons, ibis, and beautifully plumed egrets. The list of wildlife spotting goes on. Other smaller shorebirds join in the mix, but since I’m not familiar enough with their nuances yet, I focus on the bigger birds. One little white heron draws my attention since I have never seen one like it before. Other birders watching nearby identify it as a juvenile little blue heron. The bird’s body, entirely white with green legs, looks so small compared to the huge great egret standing nearby. Photographers enjoy going to “Ding” to take photos with their huge cameras and giant lenses, some fixed on tripods and some held somewhat steady by hand. Other birders use binoculars. Both items are on my wish list. I notice kayaks skimming by along the calm backwater areas. Their pilots witness the Refuge from an entirely different perspective. After driving and walking along the paved road of the five-mile long Wildlife Drive, I peruse the exhibits inside the Education Center and watch some short movie clips. Artifacts still intact remind me of “Ding” and connect me more fully to his vision of conservation. A wide choice of informational activities are available on a daily basis. I notice a program about butterflies is about to start. Curious, I step into the auditorium to discover a butterfly cage (a collapsible net laundry basket with a zippered closure at the top). Inside it are a variety of live butterflies, held fast by their little feet to the netting. I settle in to watch the presentation. A fascinating talk given by local butterfly lovers opens my eyes to a challenge surrounding the Monarch: pest and weed control products. We all use them. Certainly there must be something more natural that won’t kill these beauties. I cannot imagine life without the Monarch and other butterflies (and bees, of course). 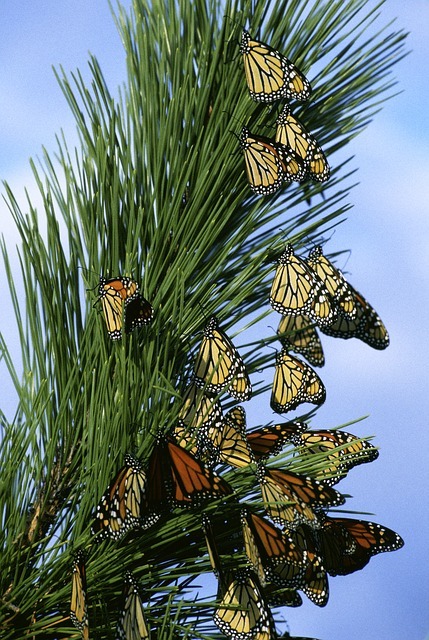 Monarch butterflies are at risk and are drastically dwindling. From their peak count, they have declined by about 90% in the last 20 years due to many factors including pesticide and herbicide use, genetically modified organisms (GMO crops), and development. More information can be found at http://www.floridanativebutterflies.org/ . There is a plant that may help bring the Monarch back from devastation: milkweed. 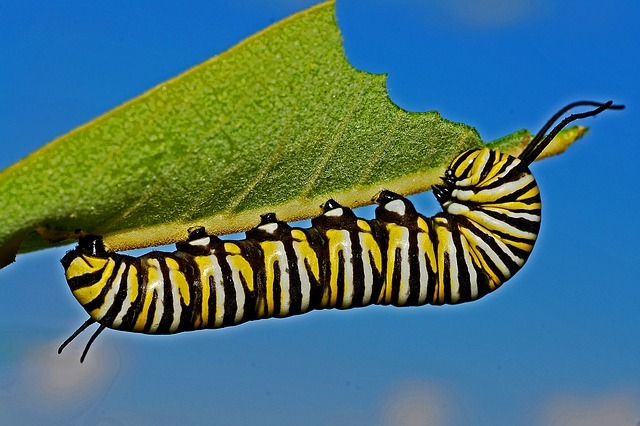 This plant is the only plant where the Monarch lays eggs, one at a time, that hatch the caterpillar that eats the leaves and sheds its skin a few times as it’s growing, and forms the pupa or chrysalis during the last shedding that protects it while it magically morphs into the Monarch. It’s a fascinating process! Pesticide-free milkweed seeds, offered at the presentation to those who ask, make their way easily into my open palm. 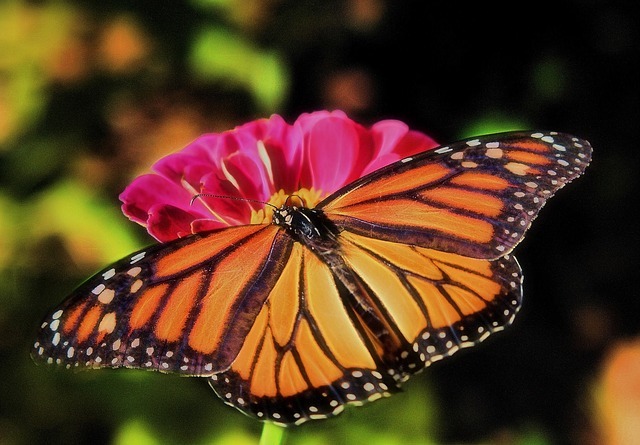 I plant them with the loving intention of attracting Monarchs to lay their precious eggs and start the cycle of life in my own yard and neighborhood. In the meantime, will you find some milkweed seeds of your own and plant them? Find a local butterfly enthusiast and you may be in luck! Think about how we can positively affect the Monarch’s chances for continued survival! My bucket list includes seeing the Monarch migration in person, up close. I can see in my mind millions of orange and yellow stained-glass wings fluttering and flitting joyfully around me! How cool will it be to see the culmination of a simple action taken by everyone who reads this post? I can’t wait! Can you? This entry was posted in Bucket List, J. N. Ding Darling, Migration, Monarch Butterfly, Sanibel and tagged Butterfly, Call to Action, Caterpillar, Chrysalis, Egg, Milkweed, Pupa. Bookmark the permalink. I will be planting Milkweed asap!!!! So happy to hear your comment, Diane! Thank you! Butterflies and Caterpillars Oh My! Never Thought I’d Sprain My Tooth!